What Is Albolene? How Does Albolene Weight Loss Work? Impatient dieters and frustrated exercisers have caught on to a trick used by boxers and athletes. They're starting to use Albolene for weight loss. Never heard of it? That may be because you use traditional (evidence-based) methods to get a better body. Albolene weight loss is a quick slim-down trick that may work for some people but comes at a price. Albolene is a product that is used to remove makeup. It is sold in drugstores around the country as a moisturizing cleanser. The product has been around for over 100 years and is highly regarded by professional makeup artists because of its ability to remove heavy makeup while keeping the skin moisturized. Ingredients in Albolene include mineral oil, petrolatum, paraffin, ceresin, and beta-carotene. If you think that none of these ingredients looks familiar as a weight loss aid, you'd be right. There is nothing in Albolene that causes weight loss, but people use it (sometimes successfully) to slim down. How Does Albolene Weight Loss Work? To use Albolene for weight loss, people spread the cream on the body part where they want to slim down. The most popular place that Albolene is used is on the belly. But some users apply the cream to the thighs, the hips, the arms, and even the lower legs. Once the cream is applied, they wrap the body part in plastic wrap—the same wrap that you use in the kitchen. Most users wrap their body part three or four times. Those who put Albolene on their belly may also put a corset-style waist trainer on top of the plastic wrap to hold the wrap and cream in place. Athletes and boxers who use Albolene for weight loss exercise with the cream and wrap under exercise gear. The goal is to lose water weight. The cream traps heat and increases sweating so that you get lighter and leaner fast. For boxers, this is especially important when they are trying to make weight for an upcoming fight. But do you actually lose weight? Well, yes—sort of. Is Albolene Weight Loss Effective? Albolene would not have become famous as a weight loss aid if there wasn't some truth to the fad. 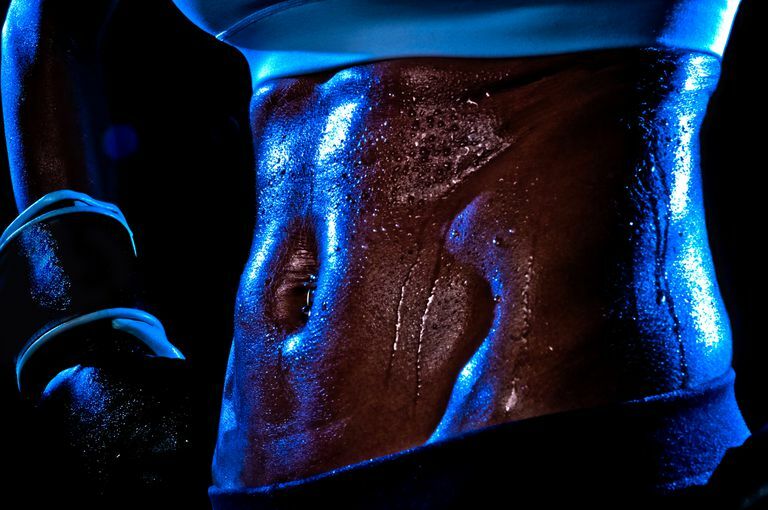 There's a reason that boxers and athletes have used this product for years. But the truth is that Albolene does nothing to cause fat loss. There are a few reasons that your Albolene-lathered body part may appear slimmer after using the product. First, if you applied saran wrap and a waist trainer, compression will make the area look smaller for a short period of time. It is no different than putting a tight rubber band around your arm. When compression is applied, you are likely to see a slight effect. Next, if you exercise while using Albolene on a regular basis, you are likely to lose weight because you are burning more calories each day. This weight loss will have nothing to do with the moisturizing cream, though. Lastly, sweating does cause water loss. When you apply Albolene and start moving, you'll instantly feel sweat build up in the area where it is applied. But water loss is different than fat loss. Water loss is temporary and offers no health benefits at all. In fact, there are clear downsides to losing weight this way. Trying to lose water weight quickly can be dangerous. There are published reports of boxers and wrestlers who cut weight too quickly and suffer heart problems and other complications from dehydration. While it is very unlikely that Albolene alone can create the kind of water loss that would put you at risk, it's not smart to get in the habit of using unhealthy weight loss methods. Next, Albolene weight loss is temporary. If you get results at all, the results will disappear once you remove the compression garment, the cream, and start drinking water again. If you are bloated and want to get rid of a belly bulge, there are safer ways to lose water weight. It can be tempting to use weight loss methods that you see on Pinterest, YouTube, or Instagram. Albolene weight loss has gained popularity with the help of these channels and the photos usually look very convincing. But it's not the smartest way to slim down. Even the company has removed weight loss claims from their website. If you're serious about losing weight, use traditional methods that have stood the test of time. Eat a healthy diet and boost your daily activity to build muscle, boost your heart health, and create better habits for long-term wellness and fitness. Reljic D, Hässler E, Jost J, Friedmann-Bette B. Rapid Weight Loss and the Body Fluid Balance and Hemoglobin Mass of Elite Amateur Boxers. Journal of Athletic Training. 2013;48(1):109-117. DOI: 10.4085/1062-6050-48.1.05.